MIDDLEBURY, Ind. — Sportscoach's designers and engineers collaborated long and hard to make the 2008 Legend® diesel Class A an impressive motorhome. 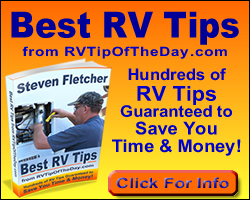 This is the coach for the experienced RVer who wants to really stand out from the crowd. From the beefy 425 horsepower Cummins engine to the small details like the automatic power cord rewind, Legend has the appointments that make it the flagship of the Sportscoach® line. It's manufacturer's suggested retail price starts at $277,000. Full-body paint graphics with a double clear coat paint finish are standard on the Legend. The only decision to make is which of the eight bold, innovative designs to choose: five are traditional and three are based on motorsports. Polished aluminum rims complement the look. Aluminum side swing compartment doors cover the huge pass through storage engineered into Legend. The coach has a laminated floor, laminated two-inch sidewalls and a laminated roof with molded fiberglass cap for additional strength and long-lasting good looks. Look at the extras built into the exterior. Fuel fills on both sides of the coach, making refueling easier. Chrome Euro-style side mirrors have an integrated turn signal for added safety, and the mirrors are heated for improved visibility in winter. The 425 horsepower Cummins engine provides 1,200 lb.-ft. of torque giving plenty of power to accelerate and climb steep grades even when towing. The two-stage engine brake provides greater peace of mind when descending steep inclines, while reducing wear on the service brakes. The independent front suspension allows a 60-degree wheel cut and each front wheel to respond on its own to uneven pavement, resulting in both better maneuvering and a smoother ride. Step into the cockpit and know for certain this is a coach designed for taking extended tours. Everything about the cockpit is designed to make the driving experience pleasurable and safe. The one-piece windshield with a dash that angles downward gives better vision of the road ahead. The rear view color monitor with distance markets graphically displays how far away objects are behind the coach. The deluxe leather, six-way power pilot seats with integrated three-point seatbelts and adjustable arms along with the remote adjustable pedals can adjust to any driving style. The solid hardwood cabinets and ceramic tile flooring from entryway through the bath area illustrate the craftsmanship that went into this coach. The cabinet doors feature European style hidden hinges. Supple ultra leather furniture and a state-of-the-art entertainment center (including a 32-inch LCD flat panel TV and home theater system) indicate the comfort and elegance Sportscoach desired to give Legend owners. Sportscoach designers have developed six interior decor options, including two motorsport decors. Wood colors include Brazilian Cherry, Sicilian Cherry and Century Glazed Maple. Notice all of the space. Each Legend has four sideouts — two in the living-kitchen area and two in the bedroom. That's ample space in which to relax or entertain family and friends. One Legend model, the 40 QIK, is perfect for entertaining. Its galley has an island, solid surface countertop and double bowl sink. A 15-cubic-foot residential stainless steel refrigerator, a three-burner range and a microwave-convection oven complete the galley. Natural sunlight washes over everything inside Legend. A large skylight brightens the galley-living area and an oversized window highlights the dinette. Side windows are built into each of the slideouts. TheMotorhome's luxury continues in the bath and bedroom area. The bath features a porcelain toilet, a textured glass door on the fiberglass shower and a skylight over the shower. Two of the three Legend models have as an option a larger shower with seats. In the bedroom, a standard residential queen bed or the optional king bed is perfect for a good night's rest. A little TV before sleep? The 19-inch LCD television stands ready to entertain. 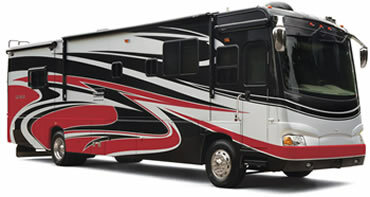 The Legend by Sportscoach is the motorhome that lets everyone know that the owner stands above the crowd. It is the epitome of luxury and the flagship of the Sportscoach line.